Is Drinking Toilet Water Safe for Your Dog? Unless you have a Teacup Yorkie or another small breed, you’ve probably experienced your pup quenching her thirst from the porcelain throne. It’s no secret dogs have some pretty unappetizing habits, and this one may take the cake. You may immediately ask yourself, ‘is toilet water safe for my dog’? It’s not ideal for your dog to drink from the toilet, but don’t fret if it happens. Why Do Dogs Drink Toliet Water? Bathroom water is most certainly not appealing to most humans, but dogs find it enticing. Why? The SPCA of Texas brings up an interesting point: dogs prefer fresh water to the stagnant H2O in their bowls. Water in the toilet is cooler and more fresh than what has been sitting in their water dish. With each flush, the bowl is replenished with new, fresh water. Flushing oxygenates the water. The porcelain bowl helps to keep the water cool and desirable for our dogs. What would you do if someone offered you a glass of ice water on an extremely hot day? What would you do if you sat down at a table at a restaurant and the glass was half full of lukewarm water? Would you drink it? When you start thinking it in terms of appeal, the toilet sounds mighty appetizing (to a dog, that is). Dogs are well-known scavengers. As Pete Wedderburn put it in The Telegraph, “Dogs have evolved to ‘eat first and ask questions later.’” If your dog sees a discarded chicken wing on the sidewalk, he’ll most likely eat it. The same is true for water. If she finds fresh, cool water in the bathroom and she’s thirsty, she’ll drink it. Is Toilet Water Harmful to Pups? We’ll get to ways to stop your pet from drinking from the toilet in a little bit. First, let’s talk about the hazards of your dog consuming that water. There are differing schools of thought on the matter. But as a general rule, it’s safer to keep your dog away from the bowl. Many homes use chemical cleaners to keep their bathroom smelling fresh. Sometimes home dwellers use cleansing discs or tablets that go into the toilet bowl or clip on the side. Those chemicals infiltrate the water, but remember, if your dog drinks from a bowl with one of those cleaners, water will dilute the chemicals. What’s more dangerous is your pup consuming one of those tablets or discs. If your dog eats one, it is time to call the vet right away. You may also be curious about water quality. It is possible the water in your toilet is laden with germs and bacteria from human waste. The ASPCA warns consuming these microorganisms could give your pup an upset stomach. One important note: if you use antifreeze to keep toilet water from freezing during the winter, it is important to keep the lid closed and your dog away from the toilet. According to the ASPCA, those chemicals are quite harmful to our beloved pets. Think about what you use to clean your bathroom. 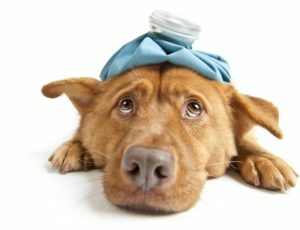 If it’s a litany of chemical-heavy cleaners, you’ll want to read the suggestions below to deter your dog from drinking from their “pool.” Otherwise, if you happen to find your dog taking a drink from the bathroom, don’t immediately panic. You can always call your vet to be safe. There are simple ways to stop your dog from lapping up toilet water. The first behavior change for you is quite simple: close the toilet lid when it is not in use. Your pup may be smart enough to open the lid using her snout. If you have a resourceful pup, keep the lid shut tightly with child-proof locks. This set from Amazon is well-rated and inexpensive. Want one other simple fix? Keep bathroom doors closed. Try to make your dog’s water more appealing. Refresh her bowl twice a day and wash it between uses. Your dog may not find plastic water bowls appealing. You can replace it with a stainless steel one. The American Kennel Club suggests purchasing your pup a dog fountain. These fountains alleviate the stagnant water problem. Some of these drinking fountains have filters, removing bad odors and tastes. Your pup may find this type of beverage more refreshing than the standard water in a bowl experience. Bottom Line: Is Toilet Drinking Harmful? We cannot tell you with one hundred percent certainty that your pup can drink from the toilet with no consequences. However, your dog has a strong digestive system, so that may offer a nice layer of protection. The most important thing to remember is that toilet cleaners are potentially dangerous. Be mindful of what you are using to clean your bathroom. If you want to change the behavior, offer your pup an alternative to drinking from a plastic bowl. 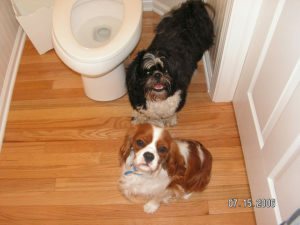 Clean and refresh their bowl frequently and keep the bathroom door shut.